Kate’s original idea was to set the smaller diamonds in the lightening bolt made of sterling silver. 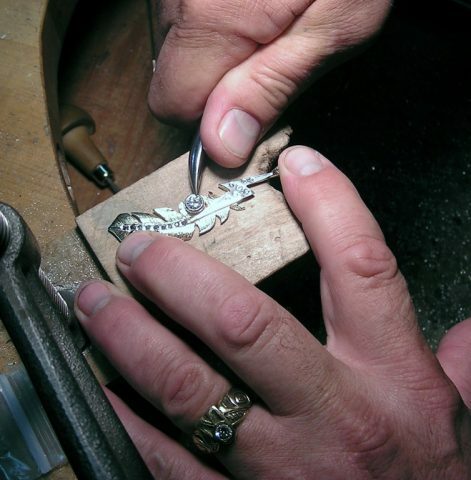 I decided that the oxidizing of sterling over time would detract from the flash of the diamonds in the lightening bolt so Owen rolled a section of 14kt white gold and welded it to the yellow gold feather to create the lightening bolt and set the 7 small diamonds. Now there will not be a problem of the lightening bolt on Kate’s Fantastic Feather Pendant loosing any of its sparks! Kate had a collection of beautiful small sapphires that we set down the spine of the feather. The bright blue sapphires are a beautiful complement to the 14kt yellow gold feather. Owen set Kate’s beautiful large diamond that was her mother’s in a tube setting nuzzled into the feather fronds and made the bale for a chain in 14kt yellow gold. The whole pendant is only 2 ¾” inches in length. A lot of the gold in this pendant was recycled from 2 rings of her mother’s along with the sapphires and diamonds. 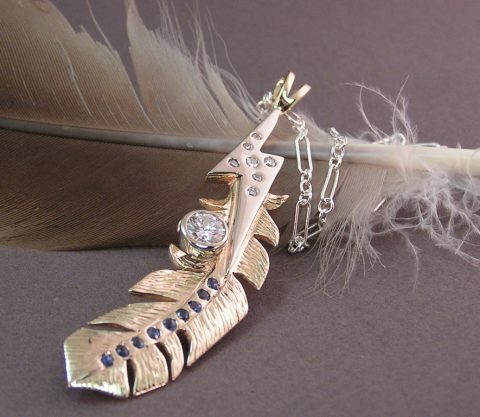 Postlet: Kate’s Fantastic Custom Feather Pendant is Finished! Kate’s Feather Pendant is Finished! This beautiful pendant is made of family memories, mementos and experiences with her sweetheart on an adventure that Kate and Mike had at Fort Robinson, NE. Now they’ll all be near her heart when she wears her Fantastic Custom Feather Pendant.